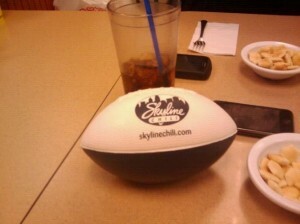 Skyline Chili Connoisseur Club Tweetup Today! If you never herd of Skyline Chili, it’s a restaurant chain out of Cincinnati, Ohio that focuses their menu around Cincinnati style chili. Cincinnati style chili is not at all like your typical chili. It doesn’t have pinto beans, or any beans for that matter and is much thicker in consistency. It is a meat based chili with some spices that give it a very unique flavor. Cinnamon is a key spice, but it doesn’t have your typical sweet cinnamon flavor we’re accustomed to with most cinnamon based foods. You definitely have to try it to appreciate the flavor. Skyline Chili is one of a number of businesses in Cincinnati that sell Cincinnati style Chili. Skyline is the only chain that I know of that has branched out of the greater Cincinnati area, you can find locations in Northeastern Ohio, throughout Kentucky and in parts of Indiana. My favorite is called a 3-way which consists of spaghetti with chili and cheese on top. My wife heather loves the coneys with everything (hot dog with chili, cheese, onions and mustard. They also have chili cheese fries, burritos and a number of other combination. My favorite Skyline Chili location is the one on the corner of Clifton and Ludlow Avenue near The University of Cincinnati. Awesome atmosphere, chili is consistent in flavor every time we visit, and it’s located in na pretty cool spot of town. Since August of 2009, every 2nd Thursday social media fans of Skyline Chili meet at the Skyline Chili Columbus Bethel Road location for lunch. For most, this is no big deal, but for me this is great! Ever since I started working from home I rarely leave the house during the day. I typically work through lunch and never really socialize with anyone until Heather and Melanie come home. Now once a month I have an opportunity to go out, get some Skyline and talk shop!!! The 3 Skyline meet-ups that I’ve attended have at least 20 attendees. There is a good combination of folks who come just to have lunch and talk about what they are doing and some folks who come to exchange business cards and network. Thanks Rocky (Rockson) for organizing the meetup!